Received August 19, 2018; Revised October 9, 2018; Accepted October 10, 2018. We used Illumina/HiSeq sequencing for analysis of gene expression profiling among four maize seed types (dent, CM3 and CM6; waxy, CM5 and CM19) at 10 DAP (days after pollination). A total of 88,993,000 (CM3), 103,817,340 (CM6), 103,139,640 (CM5), and 66,978,958 (CM19) sequence reads were generated with read lengths of about 0.9, 1.0, 1.0, and 0.7 billion bp, respectively. We obtained 69.1 (CM3), 71.0 (CM6), 71.2 (CM5), and 71.8% (CM19) high quality reads from the raw data and compared them with reference RNA sequences in a public DB (NCBI). It was revealed that mapped reads were 58%, 63%, 62%, and 62% of the EST reference in CM3, CM6, CM5 and CM19, respectively; and more than 51,000 genes were expressed based on RPKM criteria (over 0.25 value) in each CM3, CM6, CM5, and CM19 inbred line. In differentially expressed gene (DEG) analysis, we found that 3,527 genes were differentially expressed by at least two-fold with 1,709 upregulated in the two waxy inbred lines and 1,818 upregulated in the two dent inbred lines. We also detected genes for the sucrose and starch biosynthesis pathways based on BINs, and different expression patterns between waxy and dent inbred lines were shown for the gene set for starch synthesis, such as sh2, bt2, du1, wx1, and ae1. Although some genes were more expressed in dent lines, most genes for starch synthesis were much expressed in waxy lines. Especially, there was greater expression of the sus2 gene in both waxy lines compared with the dent lines. Maize is one of the most important crops in the world and is used for food, forage, and biofuel. Of total world maize production, 20 – 22% is used for human consumption, while 70 – 72% is used for forage because of the high coefficient of dry matter conversion of maize into milk, meat, and eggs (Iordan et al. 2015). Generally, maize can be divided into two types depending on the starch composition of the endosperm in the kernel: normal maize (or non-waxy corn, including dent and flint corn) and waxy maize (or waxy corn). Normal maize is widely cultivated and used for food and animal feed worldwide, but waxy maize is a special type of cultivated maize that is used as human food in Asian countries such as in China, Korea, and Japan (Hao et al. 2015). Normal and waxy corn differ in terms of starch content (amylose and amylopectin) (Nelson and Rines 1962). Starch is the main and most abundant component in maize kernels, accounting for 70% of the dry kernel weight (Xiao et al. 2016). The starch content of normal maize is about 25% amylose and 75% amylopectin, whereas that of waxy corn is exclusively amylopectin (Sprague et al. 1943; Nelson and Rines 1962). In maize, many genes are associated with starch biosynthesis, including Shrunken1 (Sh1), Shrunken2 (Sh2), Brittle1 (Bt1), Brittle2 (Bt2), Waxy1 (Wx1), Dull1 (Du1), Amylose extender1 (Ae1), Sugary1 (Su1), Sugary2 (Su2), SBEIa, SBEIIa, and Zpu1 (Hennen-Bierwagen and Myers 2013). In waxy maize, there is a drastic reduction in synthesis of amylose as a result of a recessive mutation of the waxy gene (wx) (Wessler and Varagona 1985; Zheng et al. 2013). Although the general process of starch metabolism in maize is well understood, its regulation still remains unclear. Dent corn is one among various types of maize in terms of texture or starch content. It is characterized by the presence of a flinty endosperm at the sides and back of the kernels and a core that is a soft endosperm extending to the crown of the endosperm, and that collapses during drying to produce an indentation that distinguishes it from other types of maize. Dent is cultivated in many countries and most varieties are yellow with only a few white types. Although used mainly as animal feed, which accounts for approximately 90% of total production, dent corn also serves as a raw material for industry and as a staple food (Brown et al. 1985). While normal maize, especially dent corn, is cultivated extensively in many countries, including the U.S.A. and European countries, in Korea waxy corn is a widely cultivated and very popular type. Thus Korean maize breeding programs have focused on the development of waxy corn varieties, resulting in the development in Korea of many waxy corn varieties, such as Yeonnong 1 (Lee et al. 1992), Mibaekchal (Park et al. 2002), chalok 4 (Jung et al. 2006a), Ilmichal (Jung et al. 2006b), Mibaek 2 (Park et al. 2007a), and Miheugchal (Park et al. 2007b). However, over 90% of the total cultivated area of waxy corn is occupied by the varieties Mibeak 2, Yeonnong 1, and Miheugchal. Some dent corn varieties, such as Gangdaok (Son et al. 2006), Kwangpyeongok (Moon et al. 2001), Dapyeongok (Son et al. 2015), and Jangdaok (Son et al. 2004), have been developed and used in Korea for animal forage and silage. Therefore, research into the genes for grain starch composition and content are very important to develop breeding materials that can make various varieties in Korean maize breeding programs. As mentioned above, many genes are involved in the pathway of starch composition. A key means to research the mechanisms of seed development is to identify gene activities and functions (Chen et al. 2014). Therefore, a global assessment of gene expression is needed to understand the mechanism of seed development at the genome level (Yue et al. 2008). Recently genomics, facilitated by the utilization of new tools and techniques that allow the identification of the whole genome, has enabled breeders to direct selection of the genotype associated with a specific phenotype (Tester and Langridge 2010). New genomic tools such as microarray have contributed to expanding and accelerating gene expression studies (Pérez-de-Castro et al. 2012). Microarray technology is a valuable tool that enables research into thousands of genes at one time and into the control of complex pathways and pathway interactions in animal and plant development (Yamazaki et al. 2002; Leonhardt et al. 2004). In maize, this technology has been used to investigate the global gene expression in stress response and embryo and endosperm development in seed (Lee et al. 2002; Zinselmeier et al. 2002; Yu and Setter 2003). However, microarray depends on genome annotation or probes contained in the array platform. Recent advances in next-generation sequencing (NGS) provide a fast, cost-effective, and reliable approach to generating large expression datasets for functional genomic analysis (Tong et al. 2015). RNA-Seq is the direct sequencing of transcripts by high-throughput sequencing technologies, and it has substantial advantages for providing genome-wide information, detection of novel transcripts, and allele-specific expression (Wang et al. 2009). Moreover, in contrast with microarray, this approach allows for the detection of single nucleotide polymorphisms (SNPs), which are of particular interest when studying allele-specific expression patterns (Paschold et al. 2012). RNA-Seq technology for whole-transcriptome studies has been used to confirm the transcriptome for seedling, kernel and leaf meristem, shoot apical meristem, embryo, and endosperm development in maize (Prioul et al. 2008; Fu et al. 2010; Kakumanu et al. 2012; Takacs et al. 2012; Lu et al. 2013). 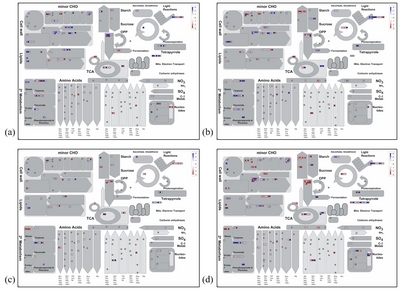 A comparison of the transcriptomes of the seed is essential for understanding the developmental process of seed development in different types of dent and waxy maize. However, there is still limited information on the global gene expression network throughout seed development in maize. In this study, we sequenced and assembled four maize inbred lines (2 dent corn inbred lines and 2 waxy corn inbred lines) in order to perform comparative expression profiling between dent and waxy corn kernels. The comparative differentially expressed gene (DEG) profiling and functional classification based on the Gene Ontology (GO) between dent and waxy corn were predicted. Moreover, contigs and DEGs indicating different kernel types were identified in specific chromosomes. Our results may provide important information for future studies of dent and waxy maize breeding programs. Four maize inbred lines, CM3 and CM6 (dent type) and CM5 and CM19 (waxy type), were grown in a field at the College of Agriculture and Life Science, Kangwon National University, Chun-Cheon, Gangwon-do, Korea. Ears of each inbred line were bagged before silk emergence to prevent contamination. Because of the different flowering times (tasseling and silking) of the inbred lines, kernels of each inbred line were generated by selfing in accordance with the flowering time. At 10 days after pollination (DAP), seeds of each inbred line were isolated and transferred into separate tubes, before being frozen in liquid nitrogen and stored at −80°C until RNA extraction. The total RNA from four maize inbred lines (CM3, CM4, CM5, and CM19) was isolated and purified using the Hybrid-R™ kit (GeneAll Biotechnology Co., Seoul, Korea). The cDNA library construction and high-throughput mRNA sequencing using Illumina sequencing platform HiSeq 2500 (Illumina, San Diego, CA, USA) were performed at the National Instrumentation Center for Environmental Management (NICEM, Seoul National University, Seoul, South Korea). The sequencing was generated with 150 bp × 2 of paired-end reads in accordance with the manufacturer’s protocol. The raw reads were filtered out with trimming of adaptor nucleotides and low quality nucleotides (reads containing more than 50% bases with Q-value ≤ 20) using trimmomatic (Bolger et al. 2014). The high quality data were assembled by Trinity (v2.4.0) de novo assembler software (https://github.com/trinityrnaseq/trinityrnaseq/wiki) to check for newly expressed genes. We used the maize transcriptome reference B73 RefGen_v3 (https://www.maizegdb.org/) to analyze the DEG analysis between waxy and dent lines. The filtered mRNA sequencing data were aligned to the transcriptome reference and the expressed data checked using RSEM software (https://deweylab.github.io/RSEM/). The DEGs were calculated through comparing the log2 fold change of normalization of data of expressed reads using TMM (Trimmed Mean of M values) of EdgeR v3.22.1 DEG analysis package software (https://bioconductor.org/packages/release/bioc/html/edgeR.html). We have isolated the expressed genes that were statistically significantly different between waxy and dent lines using the False Discovery Rate (FDR) value < 0.05 and log2 fold change value. For functional annotation clustering, we used the Data-base for Annotation, Visualization, and Integrated Discovery (DAVID) Bioinformatics Resources v 6.8 software (https://david.ncifcrf.gov/) for the GO categories of cellular component (CC), biology process (BP), and molecular function (MF). The statistically significant GO terms enrichment analysis for DEGs was conducted with thresholds of P-value < 0.05 and enrichment gene count > 2 in DAVID software. The enriched BINs of the DEGs were confirmed using PageMan analysis with the ORA_FISHER test (cutoff value = 1.0) (Usadel et al. 2006), and waxy or dent upregulated genes were assigned to metabolic pathways by the MapMan tool (Thimm et al. 2004). To obtain the transcriptional profile in 10 DAP seeds from dent and waxy corn inbred lines, we performed RNA-Seq on four samples, 2 dent corn inbred lines (CM3 and CM6) and 2 waxy corn inbred lines (CM5 and CM19). For the 10 DAP seeds of each type of dent and waxy corn inbred lines, a total of 88,993,000 (CM3), 103,817,340 (CM6), 103,139,640 (CM5), and 66,978,958 (CM19) sequence reads were generated with read lengths of about 0.9, 1.0, 1.0, and 0.7 billion bp, respectively. After filtering high quality sequences with a Phred quality score of at least 20 and read length of more than 50 bp in the four maize inbred lines, we obtained 69.1 (CM3), 71.0 (CM6), 71.2 (CM5), and 71.8% (CM19) high quality reads from the raw data (Table 1). For mapping each transcriptome in the two dent and two waxy corn inbred lines, we made a comparison with reference RNA sequences in a public DB (NCBI) and revealed that mapped reads were 58%, 63%, 62%, and 62% of the EST references in CM3, CM6, CM5, and CM19, respectively (Table 1). We assembled the high-quality reads that were generated from the CM3, CM6, CM5, and CM19 inbred lines, and a total of 72,774 (CM3), 70,390 (CM6), 82,496 (CM5), and 54,555 (CM19) contigs were assembled with average lengths of 486, 452, 457, and 518 bp, respectively (Table 2). In a comparison with GenBank data, we could not find any new genes among the contigs. To estimate the gene expression of unigenes in the four samples, among a total of 98,696 genes of the reference sequence in the NCBI, more than 51,000 genes (upwards of 52% of total reference genes) were expressed based on RPKM criteria (over 0.25 value) in each CM3, CM6, CM5, and CM19 inbred line (Table 3). In DEG analysis, we found that 3,527 genes were differentially expressed by at least two-fold with 1,709 upregulated in waxy corn inbred lines and 1,818 upregulated in dent corn inbred lines (Fig. 1). More differentially expressed contigs were identified in waxy corn than in dent corn at different fold change levels: 1–4 fold (1,051 up and 1,186 down), 4–8 fold (310 up and 373 down), 8–16 fold (156 up and 148 down), and ≥ 16 fold (148 up and 105 down), indicating changes in expression levels during seed development between dent and waxy corn lines. A total of 17 GO functions were detected for waxy and dent-upregulated genes using DAVID software. The waxy-upregulated DEGs were enriched in 8 GO terms and the dent-upregulated DEGs were enriched in 9 GO terms (Table 4). The genes for waxy-upregulated DEGs were related with enrichments of CC, such as integral component of membrane, intrinsic component of membrane, membrane part, and membrane; and BP, such as response to stress, response to oxygen-containing compound, response to abiotic stimulus, and response to acid chemical. The functional annotation of dent-upregulated DEGs showed trends toward MF (Fig. 2), such as heme binding, tetrapyrrole binding, oxidoreductase activity, acting on paired donors, with incorporation or reduction of molecular oxygen, iron ion binding, and oxidoreductase activity; and CC, such as integral component of membrane, intrinsic component of membrane, membrane part, and membrane (Table 4). Moreover, we detected more expressed genes in waxy inbred lines on chromosome 4. Based on log2 value > 1.0, a total of 261 of 8,604 genes were selected (Fig. 3). We also performed functional enrichment analysis that showed these genes were enriched in 2 GO terms, namely MF, such as nutrient reservoir activity, and CC, such as integral component of membrane, intrinsic component of membrane, membrane part, and membrane (Table 5). To confirm specific genes for each maize inbred line, the mRNA transcript levels of the genes in four combinations of the four maize inbred lines (CM5/CM3, CM19/CM3, CM5/CM6, and CM19/CM6) were compared using MAPMAN software. 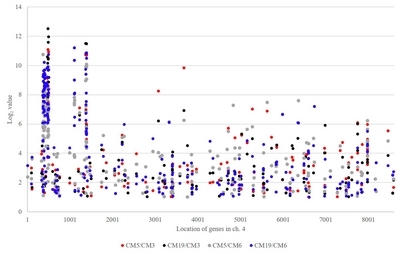 Among 98,696 genes, a total of 2,548 genes (815 and 1,733 genes upregulated at least over two-fold in both CM5 and CM19 compared with CM3 or CM6, respectively) were upregulated genes in waxy corn inbred lines; whereas, a total of 2,857 genes (1,478 and 1,379 genes upregulated at least over two-fold in both CM3 and CM6 compared with CM5 or CM19, respectively) were upregulated genes in dent corn inbred lines (Fig. 4). In addition, expression of 370 genes was commonly upregulated in waxy corn inbred lines for the four different combinations, while expression of 272 genes was commonly upregulated in dent corn inbred lines for the maize inbred line combinations (data not shown). The significant BINs for representative functional pathways of DEGs were detected in the four combinations of maize inbred lines using Fisher’s exact test with a cut-off value of 1.0 (Fig. 5). The enriched BINs of the waxy upregulated genes were photosynthesis (PS).light reaction and calvin cycle, major CHO metabolism-related functions, glycolysis, gluconeogenese, TCA, lipid metabolism-related DEGs, amino acid metabolism, metal handling, secondary metabolism, hormone metabolism, nucleotide metabolism, misc-related functions, RNA, DNA, protein-related functions, signaling and development-related DEGs, and transport (Fig. 5). For the dent upregulated genes, there was over-expression of enriched BINs such as PS, light reaction, photosystem II, minor CHO metabolism, mitochondrial electron transport, cell wall-related functions, lipid metabolism, secondary metabolism-related DEGs, hormone metabolism, stress biotic and abiotic, nucleotide metabolism, misc, RNA regulation of transcription, DNA synthesis, protein-related functions, signaling, and transport. To identify expressions of DEGs associated with metabolic pathways, DEGs for each of the four combinations of the four maize inbred lines (based on over two-fold change of expression level in each combination) were assigned to the corresponding BINs using the MAPMAN tool (Fig. 6). 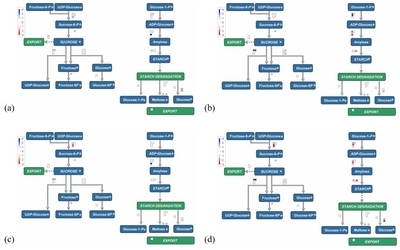 Based on each of the four combinations of the inbred lines, many genes expressed in 10-DAP waxy and dent seeds were detected in common metabolic pathways. However, some genes upregulated in waxy and dent were only expressed in independent metabolic pathways, such as, for dent upregulated genes, cell wall proteins.AGPs, protein.LRR, degradation.mannanxylose-arabinose-fucose (in cell wall)/nitrate metabolism, N-degradation (in N-metabolism)/synthesis.glutamate family. proline, synthesis.aromatic aa.chorismate, synthesis.histidine, degradation.serine-glycine-cysteine group.glycine (in amino acid metabolism)/simple phenols, N misc (in secondary metalbolism)/ascorbate and glutathione (in reduction-oxidation)/synthesis.pyrimidine, phosphotransfer and pyrophosphatases, deoxynucleotide metabolism (in nucleotide metabolism) and non-reductive PP (in OPP); and such as, for waxy upregulated genes, pectin*esterases (in cell wall) synthesis for aspartate family.lysine, branched chain group.common, branched chain group. leucine specific, serine-glycine-cysteine group.glycine, serine-glycine-cysteine group.cysteine, aromatic aa. phenylalanine and tyrosine and degredation for.glutamate family.glutamine, serine-glycine- cysteine group.cysteine, aromatic aa.tryptophan (in amino acid metabolism)/trehalose.TPP (in minor CHO metabolism) and S-assimilation (Fig. 6 and Supplementary Table S1). We also identified metabolic pathways for genes showing over two-fold expression in all four combinations. Although the same genes for each combination had different expression levels, dent-specific genes were involved in metabolic pathways such as cell wall proteins.LRR, degradation for mannan-xylose-arabinosefucose and pectate lyases and polygalacturonases (in cell wall)/TCA/org. transformation.TCA.2-oxoglutarate dehydrogenase, ascorbate and glutathione (in reduction-oxidation)/nitrate metabolism.NR (in N-metabolism)/flavonoids.chalcones, and simple phenols (in secondary metabolism). Moreover waxy-specific genes were involved in pathways such as degradation for cellulases and beta-1,4-glucanases (in cell wall)/TAG synthesis and FA synthesis and FA elongation.ACP desaturase and lipid degradation.lysophospholipases.glycerophosphodiester phosphodiesterase (in lipid metabolism)/degradation.sucrose. Susy (in major CHO metabolism)/glycolysis.PEPCase, gluconeogenese/glyoxylate cycle.pyruvate dikinase, other electron carrier (ox/red).ferredoxin (in PS.lightreaction)/synthesis.serine-glycine-cysteine group.glycine and degradation.aspartate family.lysine, and degradation. aromatic aa.tryptophan (in amino acid metabolism). Finally common expression for dent and waxy genes was detected in minor CHO metabolism.raffinose family. raffinose synthases.putative (Supplementary Fig. S1, Supplementary Table S2). Based on BINs and gene description, we detected genes associated with the sucrose and starch synthesis pathways, with a total of 42 genes being confirmed for these pathways. However, five genes were not expressed in our four waxy and dent corn combinations. Although most genes were expressed with under log2 1.0 value, many genes showed over two-fold differentiated expression levels for waxy or dent inbred lines (Table 6). The comparative analysis of four maize inbred lines (CM3, CM5, CM6, and CM19) was carried out to analyze the DEG profiling among four maize combinations (CM5/CM3, CM19/CM3, CM5/CM6, and CM19/CM6). All of the expressed genes were confirmed by mapping with the 98,696 genes of reference contig sequences at the NCBI. We found a number of DEGs by comparing gene expression between the two waxy and two dent corn inbred lines. Of the 3,527 genes that were DEGs with at least a two-fold elevation, 1,709 were upregulated in waxy inbred lines and 1,818 were upregulated in dent inbred lines (Fig. 1). Based on GO functional enrichment analysis, membrane-related GO terms were commonly clustered in waxy and dent-expressed genes. Waxy-upregulated genes were only clustered in response to stress, oxygen-containing compound, abiotic stimulus, and acid chemical; whereas dent-upregulated genes were clustered in heme binding, tetrapyrrole binding, oxidoreductase activity, iron ion binding, and oxidoreductase activity (Table 4). Although some waxy and dent upregulated genes showed higher expression in common metabolic pathways using MAPMAN tools based on BINs, many other genes upregulated in waxy and dent were involved in independent pathways (Supplementary Fig. S1). These results indicate functional differences of the genes involved in the seed developmental mechanisms for waxy and dent corn seed. In particular, we detected more expressed waxy upregulated genes than those of dent in chromosome 4, and almost all waxy upregulated genes in chromosome 4 were confirmed by functional enrichment analysis as being genes encoding 19-kD and 22-kD a-zein protein (Fig. 3, Table 5). Zeins are the most important storage proteins, accounting for 70% of maize endosperm proteins in maize endosperm for seed quality and translucency (Wu et al. 2010; Chen et al. 2014; Wu and Messing 2014). Moreover, previous studies confirmed the expression of 19-kD α-zein and 22-kD α-zein genes in endosperm at 10 DAP, and this study is in agreement with earlier reports. The present study also compared gene expression levels for each maize combination, CM5/CM3, CM19/CM3, CM5/CM6, and CM19/CM6. We used a total of 98,696 maize reference unigene genes for each combination. Although 815 and 1733 waxy genes were detected as being upregulated in both CM5 and CM19 in comparison with CM3 and CM6, numerous genes upregulated in waxy showed a maize inbred line-specific gene expression pattern. For example, waxy inbred lines CM5 and CM19 had a different number of DEGs (1895 and 801 genes) compared with dent inbred line CM3. 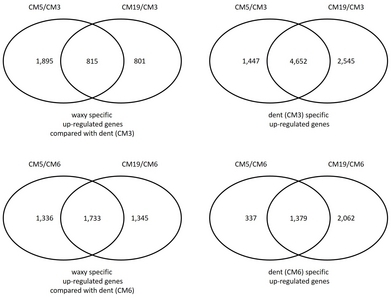 Similar results were obtained when CM5 and CM19 were compared with CM6, and even dent upregulated genes showed similar results (Fig. 4). PageMan analysis also confirmed similar results (Fig. 5). To confirm DEGs related with metabolic pathways, DEGs (an over two-fold expression level in each combination) were assigned using the MAPMAN tool (Fig. 6). The results showed that DEGs for each combination were expressed in various pathways and also confirmed line- and combination-specific expression patterns for different genes. Moreover, irrespective of dent lines, waxy inbred lines CM5 and CM19 had notable differences in expressed genes. In a comparison between CM5 and CM19, there were more DEGs for CM19 than for CM5. For example, in MAPMAN, a total 178 and 112 waxy and dent upregulated genes were assigned in metabolic pathways for CM5/CM3 and CM5/CM6, respectively; whereas 181 and 235 waxy and dent upregulated genes were involved in the same pathways for CM19/CM3 and CM19/CM6, respectively (Fig. 6). These results indicate that a number of line-specific DEGs were expressed in CM5 and CM19 10 DAP seed. Maize is generally divided into normal and waxy maize depending on the starch composition of the endosperm in the kernel. Starch makes up most of the biomass of the maize hybrid and is the most important and main yield component in maize breeding programs (Lu et al. 2013). Starch biosynthesis begins with the degradation of sucrose by sucrose synthase (SUS), and then many enzymes are involved to amylopectin or amylose biosynthesis: ADP-glucose pyrophosphorylase (AGPase encoded by brittle2 (bt2) and shrunken2 (sh2)), soluble starch synthases (SSs) and granule-bound starch synthase (GBSS, encoded by waxy (wx)), starch-branching enzyme (BE, encoded by amylose extender1 (ae1)), and starch-debranching enzyme (DBE, encoded by sugary1 (su1)) (Jeon et al. 2010). The RNA used in this study was extracted from 10 DAP seed of two waxy and two dent inbred lines to confirm DEGs in different kernel types, and we detected the genes for the sucrose and starch biosynthesis pathways using MAPMAN based on BINs (Table 6, Fig. 7). The results showed a different expression pattern for the gene set for starch synthesis, such as sh2, bt2, ss1 du1, wx1, ae1, and sus2, between waxy and dent inbred lines. Although some genes were more expressed in dent lines, most of the genes for starch synthesis were more expressed in waxy lines. Especially, sus2 gene was more expressed in both the waxy lines than either of the dent lines (Table 6). In a comparison between the two waxy lines of 10 DAP seed, CM5 and CM19, the gene expression levels were higher in CM19. These results indicate that genes for starch synthesis in CM19 had more transcription compared with the genes in the other waxy line and the dent lines. In this study, we exploited the de novo assembled transcriptome method to perform a comparative expression analysis between two waxy and two dent corn inbred lines. We detected at least two-fold upregulation of 1,709 genes in waxy corn inbred lines and 1,818 genes in dent corn inbred lines. Although many DEGs were not aligned in a functional pathway by MAPMAN software, we identified differences between waxy and dent inbred lines in some DEGs, such as genes in chromosome 4 and those involved in starch synthesis. Finally, these comparative gene expression results for waxy and dent corn inbred lines may provide valuable information for maize breeding programs. This study was supported by the Cooperative Research Program for Agriculture Science & Technology Development (Project title #PJ01315701, Project #PJ013157), Rural Development Administration, Republic of Korea. Fig. 1. Genes with at least 2-fold differences in expression between waxy and dent seed at the development step. A total of 3,527 genes include over 2 fold expressed genes. 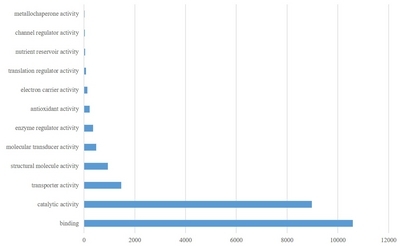 Each value in X-axis means log value from 2-fold to 64-fold. Fig. 2. Categories in molecular function ontology of waxy and dent upregulated genes. Fig. 3. 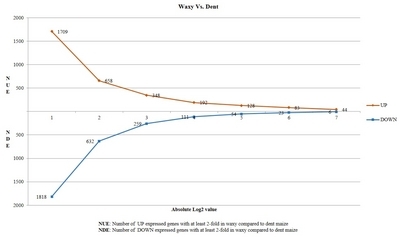 Dot histogram for waxy upregulated genes in Ch. 4 with at least 2-fold differences compared with dent. Fig. 4. Venn diagram for differentially expressed genes (DEGs) detected in the maize inbred lines. Fig. 5. Enriched BINs of DEGs using the PageMan analysis. The box colors represent the average signals of genes involved in each BIN category. Fig. 6. Transcription levels of DEGs included in metabolic pathways. (a): CM5/CM3, (b): CM19/CM3, (c): CM5/CM6, (d): CM19/CM6. Fig. 7. Transcription levels of total genes involved in starch and sucrose pathways in all four combinations. (a): CM5/CM3, (b): CM19/CM3, (c): CM5/CM6, (d): CM19/CM6. Summary of RNA sequencing data, high quality and mapped reads to the maize reference EST unigenes in the 4 dent and waxy maize inbred lines. Contigs by de novo assembly in four maize inbred lines. Summary of total genes reported in maize and expressed genes with at least 0.25 score normalized with RPKM each inbred lines. Functional enrichment clusters of maize genes using the DAVID software with the biological process. CC: cellular component, BP: biological process, MF: molecular function. Functional enrichment clusters of waxy upregulated genes in Ch. 4 using the DAVID software with the biological process. MF: molecular function, CC: cellular component. The gene list and expression level involved in sucrose and starch-related pathway based on BINs. detected from MaizeGDB based on ID. Bolger, AM, Lohse, M, and Usadel, B (2014). Trimmomatic: a flexible trimmer for Illumina sequence data. Bioinformatics. 30, 2114-2120. Chen, J, Zeng, B, Zhang, M, Xie, S, Wang, G, and Hauck, A (2014). Dynamic transcriptome landscape of maize embryo and endosperm development. Plant Physiol. 166, 252-264. Fu, J, Thiemann, A, Schrag, TA, Melchinger, AE, Scholten, S, and Frisch, M (2010). Dissecting grain yield pathways and their interactions with grain dry matter content by a two-step correlation approach with maize seedling transcriptome. BMC Plant Biol. 10, 63. Hao, D, Zhang, Z, Cheng, Y, Chen, G, Lu, H, and Mao, Y (2015). Identification of genetic differentiation between waxy and common maize by SNP genotyping. PLoS One. 10, e0142585. Jeon, JS, Ryoo, N, Hahn, TR, Walia, H, and Nakamura, Y (2010). Starch biosynthesis in cereal endosperm. Plant Physiol Biochem. 48, 383-392. Jung, TW, Moon, HG, Son, BY, Kim, SJ, Cha, SW, and Min, HK (2006a). A new waxy corn hybrid cultivar, “Chalok 4” with good eating quality and high yield. Korean J Breed Sci. 38, 133-134. Jung, TW, Moon, HG, Son, BY, Kim, SJ, Cha, SW, and Min, HK (2006b). A new waxy corn hybrid cultivar, “Ilmichal” with good eating quality and lodging resistance. Korean J Breed Sci. 38, 135-136. Kakumanu, A, Ambavaram, MM, Klumas, C, Krishnan, A, Batlang, U, and Myers, E (2012). Effects of drought on gene expression in maize reproductive and leaf meristem tissue revealed by RNA-Seq. Plant Physiol. 160, 846-867. Lee, JM, Williams, ME, Tingey, SV, and Rafalski, AJ (2002). DNA array profiling of gene expression changes during maize embryo development. Funct Integr Genomics. 2, 13-27. Lee, WK, Lee, HB, Choi, JE, Choi, CY, Choe, BH, and Park, SU (1992). Agronomic characteristics of glutinous maize, Huin Chal 1. J Agri Sci Chungnam Nat’l Univ, Korea. 19, 269-272. Leonhardt, N, Kwak, JM, Robert, N, Waner, D, Leonhardt, G, and Schroeder, JI (2004). Microarray expression analyses of Arabidopsis guard cells and isolation of a recessive abscisic acid hypersensitive protein phosphatase 2C mutant. Plant Cell. 16, 596-615. Lu, X, Chen, D, Shu, D, Zhang, Z, Wang, W, and Klukas, C (2013). The differential transcription network between embryo and endosperm in the early developing maize seed. Plant Physiol. 162, 440-455. Moon, HG, Son, BY, Cha, SW, Jung, TW, Lee, YH, and Seo, JH (2001). A new single cross hybrid for silage “Kwangpyeongok”. Korean J Breed Sci. 33, 350-351. Nelson, OE, and Rines, HW (1962). The enzymatic deficiency in the waxy mutant of maize. Biochem Biophys Res Commun. 9, 297-300. Park, KJ, Min, HK, Heo, NK, Ryu, SH, and Park, JY (2002). A new high quality and yielding waxy corn hybrid, ‘Mibaekchal’. Korean J Breed Sci. 34, 377-378. Park, KJ, Park, JY, Ryu, SH, Goh, BD, Seo, JS, and Min, HK (2007a). A new waxy corn hybrid cultivar, “Mibaek 2” with good eating quality and lodging resistance. Korean J Breed Sci. 39, 108-109. Park, KJ, Ryu, SH, Min, HK, Seo, JS, Park, JY, and Goh, BD (2007b). A new black waxy corn hybrid cultivar, ‘Miheugchal’ with good eating quality and high yield. Korean J Breed Sci. 39, 106-107. Paschold, A, Jia, Y, Marcon, C, Lund, S, Larson, NB, and Yeh, CT (2012). Complementation contributes to transcriptome complexity in maize (Zea mays L.) hybrids relative to their inbred parents. Genome Res. 22, 2445-2454. Pérez-de-Castro, AM, Vilanova, S, Cañizares, J, Pascual, L, Blanca, JM, and Díez, MJ (2012). Application of genomic tools in plant breeding. Curr Genomics. 13, 179-195. Prioul, JL, Méchin, V, Lessard, P, Thévenot, C, Grimmer, M, and Chateau-Joubert, S (2008). A joint transcriptomic, proteomic and metabolic analysis of maize endosperm development and starch filling. Plant Biotechnol J. 6, 855-869. Son, BY, Baek, SB, Kim, JT, Lee, JS, Bae, HH, and Kim, WH (2015). Single cross maize hybrid with lodging tolerance for grain, ‘Dapyeongok’. Korean J Breed Sci. 47, 87-91. Son, BY, Moon, HG, Jung, TW, Kim, SJ, Sung, BR, and Huh, CS (2006). A new corn hybrid cultivar, “Gangdaok” for silage. Korean J Breed Sci. 38, 149-150. Son, BY, Moon, HG, Jung, TW, Park, NK, Kim, SK, and Cha, SW (2004). A new single cross maize hybrid cultivar, “Jangdaok” for grain and silage. Korean J Breed Sci. 36, 185-186. Sprague, GF, Brimhall, B, and Hixon, RM (1943). Some effects of the waxy gene in corn on properties of the endosperm starch. J Am Soc Agron. 35, 817-822. Takacs, EM, Li, J, Du, C, Ponnala, L, Janick-Buckner, D, and Yu, J (2012). Ontogeny of the maize shoot apical meristem. Plant Cell. 24, 3219-3234. Tester, M, and Langridge, P (2010). Breeding technologies to increase crop production in a changing world. Science. 327, 818-822. Thimm, O, Bläsing, O, Gibon, Y, Nagel, A, Meyer, S, and Krüger, P (2004). MAPMAN: a user-driven tool to display genomics data sets onto diagrams of metabolic pathways and other biological processes. Plant J. 37, 914-939. Tong, W, Kwon, SG, Lee, JS, Choi, IY, Park, YJ, and Choi, SH (2015). Gene set by de novo assembly of Perilla species and expression profiling between P. frutescens (L.) var. frutescens and var. crispa. Gene. 559, 155-163. Usadel, B, Nagel, A, Steinhauser, D, Gibon, Y, Bläsing, OE, and Redestig, H (2006). PageMan: an interactive ontology tool to generate, display, and annotate overview graphs for profiling experiments. BMC Bioinformics. 7, 535. Wang, Z, Gerstein, M, and Snyder, M (2009). RNA-Seq: A revolutionary tool for transcriptomics. Nat Rev Genet. 10, 57-63. Wessler, SR, and Varagona, MJ (1985). Molecular basis of mutations at the waxy locus of maize: correlation with the fine structure genetic map. Proc Natl Acad Sci USA. 82, 4177-4181. Wu, Y, Holding, DR, and Messing, J (2010). γ-Zeins are essential for endosperm modification in quality protein maize. Proc Natl Acad Sci USA. 107, 12810-12815. Wu, Y, and Messing, J (2014). Proteome balancing of the maize seed for higher nutritional value. Front Plant Sci. 5, 240. Xiao, Y, Thatcher, S, Wang, M, Wang, T, Beatty, M, and Zastrow-Hayes, G (2016). Transcriptome analysis of near-isogenic lines provides molecular insights into starch biosynthesis in maize kernel. J Integr Plant Biol. 58, 713-723. Yamazaki, K, Kuromitsu, J, and Tanaka, I (2002). Microarray analysis of gene expression changes in mouse liver induced by peroxisome proliferator-activated receptor alpha agonists. Biochem Biophys Res Commun. 290, 1114-1122. Yu, LX, and Setter, TL (2003). Comparative transcriptional profiling of placenta and endosperm in developing maize kernels in response to water deficit. Plant Physiol. 131, 568-582. Yue, G, Zhuang, Y, Li, Z, Sun, L, and Zhang, J (2008). Differential gene expression analysis of maize leaf at heading stage in response to water-deficit stress. Biosci Rep. 28, 125-134. Zheng, H, Wang, H, Yang, H, Wu, J, Shi, B, and Cai, R (2013). Genetic diversity and molecular evolution of Chinese waxy maize germplasm. PLoS One. 8, e66606. Zinselmeier, C, Sun, Y, Helentjaris, T, Beatty, M, Yang, S, and Smith, H (2002). The use of gene expression profiling to dissect the stress sensitivity of reproductive development in maize. Field Crops Res. 75, 111-121.